Across Michigan, 40 percent of households struggle to afford the basic necessities of housing, child care, food, health care and transportation . Capital Area United Way joined with several other United Ways to produce a statewide ALICE report. This report is an objective, data-driven, comprehensive research project that highlights the number of households who are unable to afford life's basic necessities. United Way calls this population ALICE - ALICE is an acronym that stands for Asset Limited, Income Constrained, Employed. ALICE is working and paying taxes like the rest of us. ALICE represents the men and women of all ages and races who get up each day to go to work, but who aren't sure if they will be able to put dinner on the table each night. They are our child care workers, our mechanics, our home health aids, store clerks, and office assistants - all workers essential to our community's success. 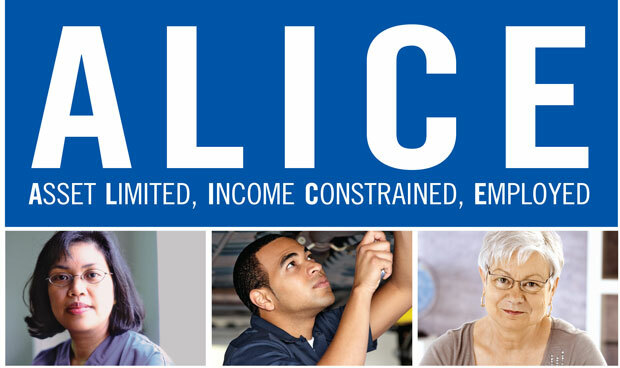 Join us in helping to promote the ALICE data and encourage the community to communicate with legislators about ALICE; particularly to take these households into consideration when deciding legislation relating to the economic stability of these households. To view a sample of email/correspondence and sample social media tweets/posts, click the download button below. For more information on ALICE or to view the ALICE report in its entirety, click HERE. Your voice can be the most powerful tool in creating positive, lasting change in our community. To learn more about other ways you can help, contact us.